Storytelling + Research = LoiS: "Just the facts, er bones, ma'am"
"Just the facts, er bones, ma'am"
The old Dragnet t.v. show used to have a deadpan policeman say to people, "Just the facts, ma'am" (or sir). Storytellers tend to be like those witnesses, fleshing out a tale, bringing it to life. Still storytellers know the outline, called the bones of a story, gives room to personalize a story. Both the storyteller and the story listener come to a story with experiences shaping the way a story is told and heard. The bones, however, like a skeleton, form a framework worth uncovering. Switching to a more modern television detective metaphor, if we take the "C.S.I." forensic approach we can reconstruct a story while staying true to its origins. But where can we dig up these bones?!? I have some favorite sources worth keeping handy. Conrad Bladey's website provided probably my first experience with story bones. All his 192 stories are Irish. I vividly remember a story there helping me teach a new storyteller to jump into the craft of storytelling. Some of the stories are barely an idea and require adding the basic story elements of beginning, middle and end. When I use his material in a workshop I either stick to what is truly a story or warn the briefest ones require more work. The work of Jackie Baldwin's wonderful Story-Lovers site looks as if it won't grow beyond what is currently online. For years Jackie incorporated suggestions from Storytell, an international email list for storytellers,while maintaining the privacy of contributors in her SOS, Searching Out Stories section as a type of searchable archive. Storytell, by the way, continues. The National Storytelling Network provides the list on its own website as a service to all. Go to Jackie's SOS to find those suggestions which often are in bones format with additional sources frequently given. Jackie's site is still up thanks to her planning for the day she would stop maintaining it. Talking about site continuance, while not part of actual bones, if you're ever digging up a site that has disappeared, use the Wayback Machine at the Internet Archive by taking the site address there to locate a past time when it appeared. Throughout the Middle East and beyond, from Egypt on into Turkey and the Islamic countries of the former Soviet Union a "wise fool" is told about. In Egypt he's called Goha. Turkey claims his origins as the Hodja, from back in the days of the ruler called Tamerlaine in English speaking countries. (That's a mispronunciation of Timur Ling, which means Timur the Lame, but his orthopedic difficulties were not something people pointed out in his presence for fear of being killed!) Stories about the Hodja are a favorite of mine and About Nasruddin has 15 tales fully told, but then you could go back to their summaries. The summaries don't quite work as bones by themselves, but after reading the story it would be almost complete. While the Hodja originates in Islam, Stories for Preaching and Teaching from Father Tommy Lane's site has a Christian focus, but like the Hodja, can fit needs way beyond religion. Those are some online sources. Some print authors of bones are Pleasant DeSpain; Jeanne Hardendorff's Just One More; Man in the Moon; Sky Tales from Many Lands by Alta Jablow and Carl Withers includes 11 about the moon; in the Public Domain, but not online yet, Angela M. Keyes wrote Stories and Story-Telling which ends with 47 pages of "Some Very Short Stories"; Shari Lewis (yes, the puppeteer) wrote several books of "1 Minute" stories; Margaret Read MacDonald has both a 3 and 5 Minute book of stories, with Three Minute Tales particularly useful. if you ask people: When you have a computer, you have the hardware, which is the computer itself, but you also have to have ______." It's true, people do say software, although one creative child first mentioned in my program you have to have a person. Davis goes on to ask: Do you have to have anything else besides hardware and software to work a computer program? That is where I sometimes hear a person, but agree with Davis that Bill Gates's fortune came from the realization of the importance of language or what is now called an operating system and similarly, just as such language is important and has changed over the years it is crucial for children to hear language. Reading can help, although that is easier with a good spoken vocabulary, and reading alone can lead to occasional mispronunciation. Traditionally family stories and folklore helped children transition to reading and written language. 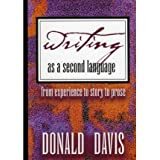 I love the back of the book where Donald Davis quotes overhearing an actual elementary school teacher say: Stop talking! You're supposed to be working on language! The elementary students I had this past week, with their parents, were young enough the children didn't know the word, outline. It was easy to show how my final story was squeezed in by knowing the bones. Those bones helped me give the essential 8 elements of the story and we all could "flesh it out" by thinking how the characters and place looked, sounded, and maybe even smelled to make a richer story. I also was delighted with the way a Romanian mother there was keeping her children aware of her cultural background and, therefore, their family's background. As Ramon Royal Ross says in his book, Storyteller, "For storytelling, in all its richness and variations, is, ultimately, a way for people to know themselves and to know others."